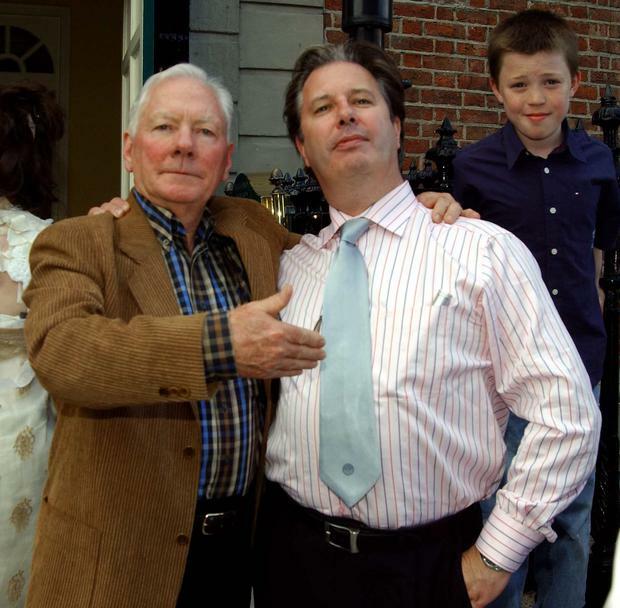 It's a moveable feast with Gay Byrne and Kathleen Watkins, or Uncle Gaybo and Auntie Kathleen as the nation fondly calls them. The last time I talked to them was over whiskey and scones in their Sandymount penthouse. This time, half a mile up the road, it is tea and scones in the InterContinental hotel. The occasion is to mark the imminent arrival of Kathleen's new book Happy Christmas, Pigin!, a must-get Yuletide pressie. The follow-up to 2016's bestseller Pigin of Howth, this is a cockle-warming tale of how the charming porker returns for a perfect Christmas day out in Dublin. He and his pal Badger - which might or might not be based on Johnny Ronan ("You're bold!" laughs Kathleen) - hook up in town for "a spot of Christmas shopping. What follows is the most wonderful day in Dublin". As is the morning I spent with Gay 'n' Kathleen. Because it is the day before Halloween, I ask Gay is he dressing up. "I certainly am not," he says. "I don't remember ever dressing up for Halloween, to be honest. We did a bit of trick-or-treating but there were too many bloody kids around Rialto and South Circular Road when I was growing up." What was Rialto like when Gay was growing up? "It was really a Guinness ghetto. There was Rialto Street, Rialto Cottages and Rialto Buildings. And there was the South Circular Road. The people in the South Circular Road looked down on the people who lived in Rialto Street. And the people in Rialto Street looked down on the people who lived in Rialto Cottages. And the people who lived in Rialto Cottages looked down on the people who lived in Rialto Buildings. There was a hierarchy of looking down." Who did the people who lived in Rialto Buildings look down on? "Well," Gay laughs, "if they lived on the top floor! But, if you look back on the conditions, they were awful..."
Saggart girl Kathleen was born on October 17, 1934 ("I was delivered at home by the father of Archbishop Ryan"); Gay in the Coombe hospital on August 5 the same year. Having both recently celebrated their 84th birthdays, I thought I'd get them to talk through the decades. Kathleen played the harp when she was a boarder at Sion Hill for five years. She was the first continuity announcer to appear on screen on the opening night of Telefis Eireann on New Year's Eve, 1961. She recalled Archbishop McQuaid coming into the station that evening: "He was very fussy that the curtains for the benediction in the room would not be the same curtains behind people who were broadcasting later." Kathleen remembers in her twenties going to America for six weeks for Irish Distillers "to do a soft-sell for Irish whiskey over there. I was saddened about the Jewish massacre the other day," she says referring to the hate crime shooting at the synagogue in Pittsburgh that left 11 dead. "When I was in Chicago a Jewish family looked after me the best. They arranged for me to meet the mayor. I will never forget their kindnesses." Kathleen reflects on her forties as being "all First Communions and Confirmations! Those years seem to be all related to the kids, don't they? We were endlessly in Donegal, too." Gay reminds her: "You were doing People And Places." Kathleen: "I was doing People And Places for a summer and I did it for six years. I discovered that the Irish welcome that we're famous for is still there, around the country, the real country people. To arrive at somebody's house at half past 10 in the morning and the table would be set and groaning under the weight of homemade bread and scones," Kathleen says with a smile as the table in InterContinental is itself groaning under the weight of scones this morning. Gay: "It was really Nationwide under a different name." Kathleen: "We love Nationwide and Mary Kennedy. "We filmed up in the North and we were in places like Crossmaglen. People were telling us all kinds of stories and we were full of fear. I was a bit scared. We were used to going up and down to Donegal, going through the Border, being stopped regularly by soldiers. They would tell me things like, 'My aunt is from Cork' or 'My mother is from County Clare'. I am reading Milkman [by Anna Burns] at the moment. It is not a barrel of laughs. We are always reading." Gay has just finished the latest biography of Oscar Wilde, Oscar, by Matthew Sturgis, "which is getting rave reviews, and he deserves it". Who were some of the great wits Gay enjoyed on The Late Late? Any that stood out? Peter Ustinov? "I suppose Ustinov would have been one of those great raconteurs. What sickens me was the number of people who were recommended to be guests on The Late Late Show on the basis that they were wonderful raconteurs. And what they were," reveals Gay, all these years later, "were long-winded bores who were very funny at two in the morning drinking and so on but in the cold light of day - nothing", says the original host of The Late Late Show. from 1962-1999. What about Bob Hope? "We got a call out of the blue saying, 'Would you like to have Bob Hope on Friday night?' And when you get a call like that, you immediately think it's Mike Murphy or Pat Kenny or someone having a go. The deal was he flew in, car to RTE, go on The Late Late, car to Dublin airport, back to London the same night. He was a lovely guy. Wonderful fun." Who else were great guests? "I loved Billy Connolly. We discovered Billy Connolly." Kathleen suggests Spike Milligan. Gay is unconvinced: "Spike was very volatile. Spike could change on the way from hospitality to the TV studio. You never knew which Spike you were going to get on." Kathleen suggests Peter Sellers. Gay: "Peter wasn't all that funny. With me." Kathleen: "He was a depressed kind of person. There was something so sensitive about him." Gay: "There was, yeah. He was a very nice man. We had dinner with him once in Kildare. He had so many stories and voices. On the spur of the moment he would go into another accent. It was quite miraculous how he could do it." I ask Kathleen did she get that feeling from watching the genius that was Gay doing The Late Late once upon a time? I have barely finished the question before Gay is answering for Kathleen: "No - she doesn't ever get that feeling. What we are having a row about at the moment is that RTE want me back on the air in January for my little Sunday afternoon programme and I won't be let go." I turn to Kathleen and say: "You're not allowing him?" I have barely got the words out, before Gay answers for her; "No! She and my two daughters [Suzy and Crona] are in a gang-up. And not for the first time. Not for the first time, but anyway, they won't let me." Kathleen, laughing: "You see, he is very spoiled. He has had three women looking after him. Well, two are gone; there is only me now. But the daughters are very hands-on. One is very managerial." Gay: "They just say I'm not up to it at the moment, and I suspect they may be partly right, but nonetheless I greatly regret that I can't do it." Kathleen, teasing: "Mother knows best!" Gay, perhaps not amused: "It was my little outlet, that's all. It was unimportant. It was only a Mickey Mouse radio programme on Sunday afternoon with a small listenership but it was an appreciative listenership. In fairness, it affects Kathleen as well, because it is her Sunday too." I ask them about what they did in their fifties. Kathleen: "We were Donegal-ing a lot. We were mountaineering an awful lot in those years." Gay, laughing, cautions: "Don't over-do the mountaineering now!" Kathleen: "We often did 15 miles up above Glenveagh. We were walking. We didn't know what we were doing. One time we were in the middle of the Donegal mountains and we put our feet into a river, boots, socks and all, because we were all in agony with our feet. It was heaven and then we carried on." Gay: "If the weather had closed in, we would have been in bad trouble. Nobody knew where we were. There was 12 or 14 of us. This was long before mobile phones." Kathleen: "And when we were eventually emerged these people in remote farmland looked amazed. As in - where have you come from?" Kathleen: "Our children were reared in Donegal in the summers." Gay: "And Crona's children are now being reared in Donegal in the summers." Kathleen: "We had great times in Donegal. I would rustle up something for friends for dinner. I was a great one for flinging in legs of lamb. A couple of legs of lamb would feed an army." Apropos of lamb, I ask Gay about the infamous time Gerry Ryan was on The Late Late in 1987. Gay: "Oh yes. When he was supposed to have killed a lamb." 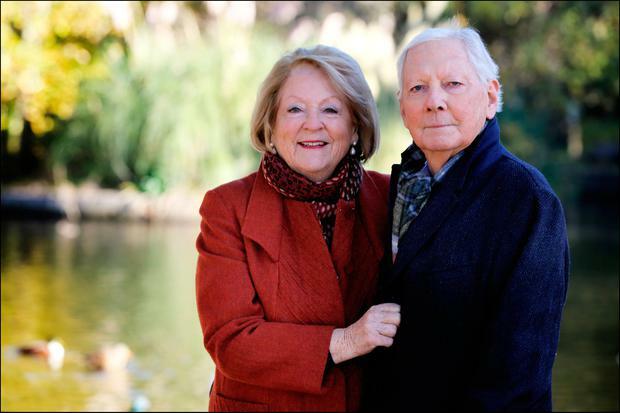 Kathleen: "That was a Gay Byrne Show radio thing, wasn't it?" Gay: "The whole idea was survival in the wild and to see how long they would last. They came up with this thing. It was a complete hullabaloo - first of all because he killed a lamb or so we were told." Gay is referring to the incident in 1987 which saw Ryan dubbed Lambo by the media with the resultant hoo-ha over the DJ's supposed killing of a lamb raised in the Dail. "Once you start telling a story like that you have to broaden it and it gets worse and worse. And then it came out that the whole thing was a lie. Actually, Gerry was very, very lucky to survive, because there was a strong movement that he should be fired. Thanks be to God that I wasn't held responsible for all that. I was back in the studio and they were reporting into me every day from some spot or other. So I didn't get any of the blame. And quite rightly, as I didn't do anything." Kathleen: "We often sit on his [Gerry's] bench in Herbert Park. We remember him there." Did Gay ever give Gerry personal advice near the end? "Not particularly. Kathleen gave him advice because she realised he was drinking far too much and putting it away late in the night, into the early morning. So, you told him off once or twice, didn't you?" Gay asks Kathleen. "Very nicely, once or twice, yes," the woman he married on June 25, 1964, in the Church of the Nativity of the Blessed Virgin Mary in Saggart, replies. "I remember one time we brought him home from somewhere and the next morning I got a call from the Gerry Ryan Show. 'Hello Kathleen. Gerry is wondering if he left his wallet in your car?' 'I have no idea. Would you hold on? I'll go out and look.' So I went out, hoping it would be there. And there it was, his wallet on the back seat of my car." Gay: "With all his credit cards, all his money, all his this-that-and-the-other. Safe and sound." And what of your sixties, I wonder? Gay: "Oh, to be 60 again!" Kathleen: "We went to Egypt, which was the most interesting place I'd ever been in my life." Gay: "We were very fit in our sixties. And we were quite fit into our seventies. I did a lot of walking." It was good for the mental health as well as the physical health? Gay: "It was good for everything. But the disadvantage is if I was a person who was a chronic, who went through life with minor ailments and was accustomed to hospital and doctors, I would have been better able to cope with my cancer when it came. But I went through 83 years of robust good health. Robust good health. I never took a tablet of any kind. I never needed a sleeping pill. I never needed any of those things. "Then suddenly - wham! Out of the blue! You cross the road from the pavement containing happy, healthy, vigorous athletic people to the other side of the street where all the invalids are and where the people who are sick are, the people who are disadvantaged and so on. And it is a completely different life. And you can't cope. It is very hard to accept it. "As my surgeon - one of my surgeons! - said to me recently, 'It is not a question of getting cured of cancer; you just manage the cancer. And you keep going to the best of your ability in your condition." Kathleen: "There is a lot of it about. We have three friends. One of them on the northside has been ill for five years. It has been horrendous. It is the worst I have ever known. "Then even in the last few weeks two people told me that they had been diagnosed and someone texted me that they were waiting on the results of a biopsy. "We are very lucky. We have comforts and have family around us." Gay: "Let's not get into a cancer conversation. It is too depressing." Swiftly changing the subject, I ask Gay and Kathleen did they ever regret Gay leaving The Late Late in 1999? "Not for a second," he says . "I don't remember us being at a loss for something to do on Friday night," laughs Kathleen. "We were always out at the theatre or a restaurant," says Gay, "being entertained." And, as is their way for the last eight decades, being entertaining. 'Happy Christmas, Pigin!' by Kathleen Watkins, illustrated by Margaret Anne Suggs is published by Gill Books (€16.99).